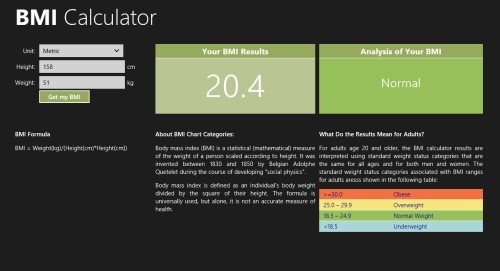 Here are 4 free Windows 8 BMI Calculator apps that let you calculate your BMI (Body Mass Index). Those who have no idea about BMI, let me tell you.. it is used to checking your body fat based on weight and height. 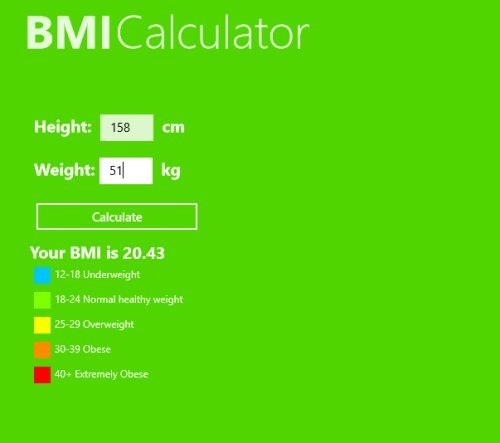 These BMI calculator Windows 8 apps let you know if you are overweight, underweight, or normal so that you can take necessary actions. Whoz BMI Calculator is a free Windows 8 BMI calculator app that lets you calculate your body mass index, thereby getting an indication of whether your body is being affected by your weight. Its, basically a measurement of your body fat, applies for both women and men. Using this BMI calculator app you can know if you are underweight, Normal healthy weight, overweight, obese, or extremely obese. All you need to do is just input your Height in Centimeters along with Weight in Kilograms and you are good to go. Go ahead and check your health by installing Whoz BMI Calculator app in Windows 8 now. BMI Calculator is another powerful and smart app using which you can calculate your body mass index, thereby determining you ideal weight range. 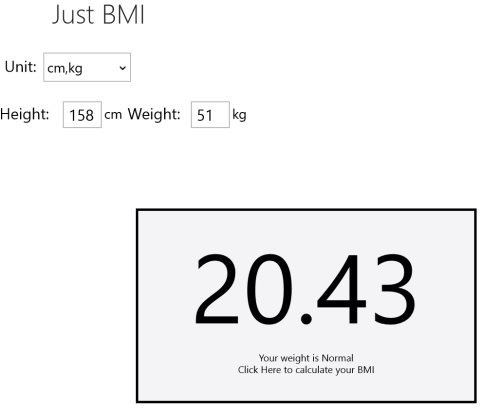 This Windows 8 BMI calculator app supports both Metric and Imperial. You can easily switch between the two anytime. For this, you need to right-click anywhere on the screen and in no time you will get the option to switch. 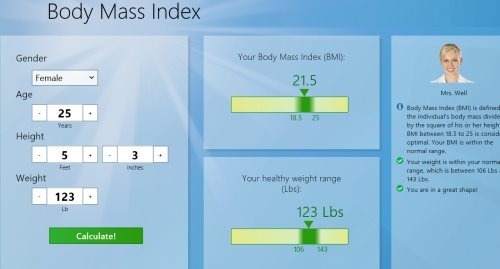 The interesting part about this BMI calculator app for Windows 8 is that the app shows ‘Your Body Mass Index’, ‘Your Health Weight Range’ and your results along with advice by Mrs. Well. You need to scroll towards the right in order to view your results. All you need to do is just select you gender, input your age, height, and weight ? click on ‘Calculate’ button once done. It works for adults, kids, children and even for babies. Go ahead and download BMI Calculator app in Windows 8 now. Standard BMI Calculator is a smart app where you can measure your body mass index based on your height and weight. This BMI calculator app shows the analysis of your body mass index and comes with a result ranging from Obese, Overweight, Normal Weight, and Underweight. You can also see the BMI Formula given on the screen. All you need to do is just select a unit type: Metric or Imperial ? input your height in Centimeters and Weight in Kilograms ? click on ‘Get my BMI’ button to get the results, instantly. You can see a list of BMI range from where you can check your body fat. Go ahead and download Standard BMI Calculator app in Windows 8 now. Also, check out our posts on Calorie Tracker Apps, Home Remedies Apps, and Unit Converter Apps. Ending my short post with Just BMI app that lets you calculate your body mass index and to see if you Weight is normal. You can calculate you BMI based on your height and weight. It comes with both the units: Metric (cm, kg) and Imperial (inches, lbs.). All you required is just select a unit type ? input your height and weight ? the app will get the results, the analysis of your BMI. In no time, you can know if you are healthy. This actually makes you take necessary action to bring your body to the required BMI range. Go ahead and download Just BMI app in Windows 8 now.